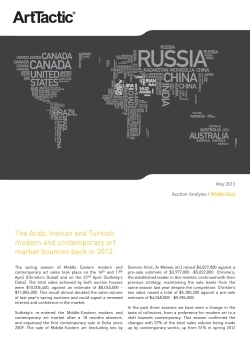 The spring season of Middle Eastern modern and contemporary art sales took place on the 16th and 17th April (Christie’s Dubai) and on the 22nd April (Sotheby’s Doha). The total sales achieved by both auction houses were $10,006,400, against an estimate of $8,045,000 – $11,806,000. This result almost doubled the sales volume of last year’s spring auctions and could signal a renewed interest and confidence in the market.